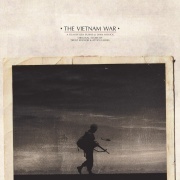 The Vietnam War Original Score was composed by Trent Reznor and Atticus Ross for the Ken Burns TV documentary miniseries The Vietnam War. It was released on September 15, 2017 on digital, double CD, and vinyl. Its release number is Null 06, in keeping with The Null Corporation's numbering system. This is not to be confused with the separate soundtrack for the same series, featuring period music by various artists. The series also features previously released Nine Inch Nails tracks (mainly from Ghosts I-IV) and Reznor/Ross tracks from The Social Network Soundtrack and The Girl With The Dragon Tattoo Soundtrack. A Universal Music Enterprises release (p)2017 Vietnam Film Project, LLC under exclusive license to UMG Recordings, Inc. (c)2017 UMG Recordings, Inc.
Motion Picture Artwork and Title (c)2017 Vietnam Film Project, LLC. Manufactured and distributed by Universal Music Enterprises, A Division of UMG Recordings, Inc., 2220 Colorado Avenue, Santa Monica, CA 90404 - U.S.A. All rights reserved. This page was last modified on 29 October 2018, at 21:37. This page has been accessed 20,120 times.